Esther Wilkey lives in Holmfirth, West Yorkshire. She has six children, a number of whom are young adults now, and works at Bradford College, teaching English to 16–18 year old asylum seekers, refugees and immigrants. “At the time I first got involved with Educate the Kids I was a stay-at-home mum. I was asked to look after four of the kids in the choir when they came to our area. 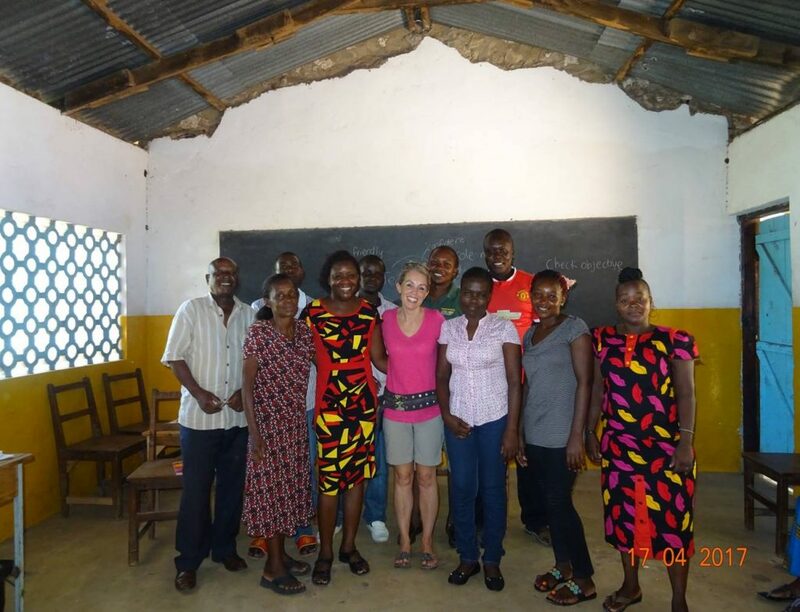 “As a Bradford College representative, I now go to Kenya twice a year, in February and July, where I help to run teacher training sessions and we share best practice between our establishments (see photo). The college raises funds for Educate the Kids, hosts events and also has also funded the internet installation at Jolaurabi School in Kenya. This has enabled my students in Bradford College to Skype the Kenyan school children and sing them a song about unity, called “Worldwide Family”, that they wrote themselves after seeing the choir perform with such positivity and passion when they visited Bradford College. Esther and friends at the school in Kenya.